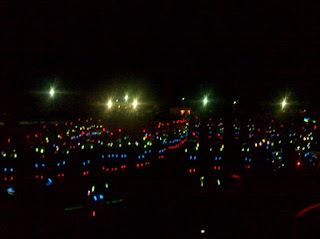 For a half time show the band hung light sticks from their uniforms and turned off the lights. 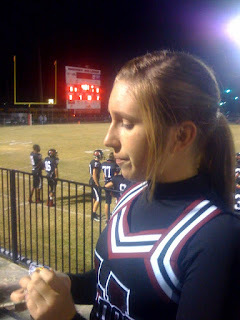 My beautiful granddaughter Sarah is an eighth grade cheer leader. 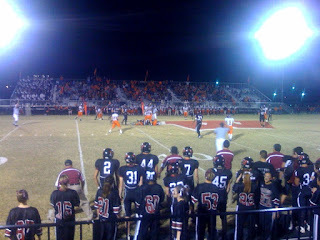 Sue and I drove back to my home town of Wagoner, Oklahoma to see them play Sallisaw. I grew up therem lived there until about 15 years ago and my ex-wife and two of my sons still live there. 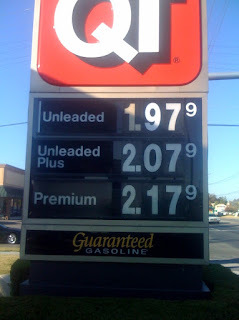 We have not seen gas under 2 dollars for a long time. 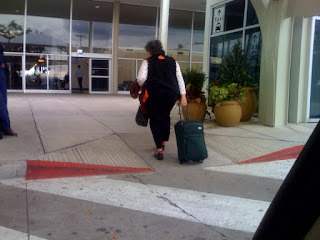 Here is the weary road warrior back from her duties as super nanny. It is good to see her agan. She will be home until mid December when she goes back to accompany Beth and Autumn to South Korea. 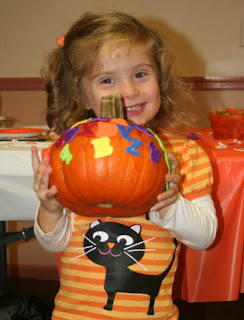 Autumn has decorated her pumpkin with stickers. 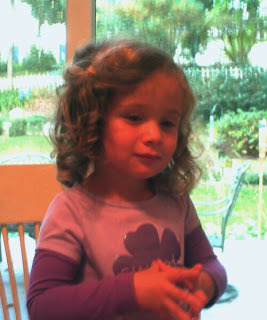 Her mom did not think she was quite ready for a carving knife. She is getting ready to go "trick or treating". CityPlex Towers sits at 81st and Lewis and is about one half mile East of the river. Its great height makes it seem nearer the waters edge when seen from the West. 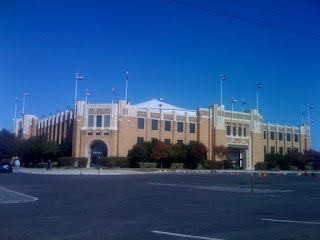 Formerly the City of Faith Hospital, the CityPlex Towers is a complex of three triangular buildings. The central tower is 60 stories, the East tower 20 stories, the West tower 30 Stories. Due to its open location it can be seen from miles away no matter how one approaches the city. Its history is interesting. Tulsa evangelist and faith healer Oral Roberts raised a great deal of money from the contributions to his radio and television ministry. He built a school here in Tulsa in the late 1960's which he modestly named Oral Roberts University. In 1977 Oral Roberts claimed to have received a vision telling him to build the City of Faith Medical and Research Center, which would become a great center of both spiritual and medical healing. 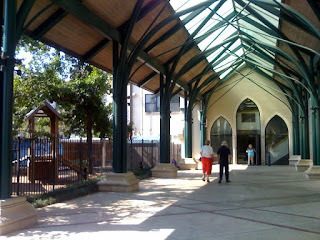 Although advised that such a large hospital could not be financially sustainable, Roberts claimed to have more visions of Jesus who encouraged him to continue the project. He believed that Evangelical Christians would come from great distances to receive treatment at the City of Faith. The hospital accepted its first patient in November 1981. By 1986 the City of Faith was losing over $10 million dollars a year. In 1987, with costs spiraling out of control, the medical center went largely vacant. Roberts told a television audience unless he raised $8 million by March, God would "call him home" (a euphemism for death). The donations goal was reached but Roberts soon began looking for buyers or people to manage the facility. Unfortunately, many of the sick who came from great distances did so expecting to be treated at no cost, creating a difficult situation. In 1989, only eight years after it opened, the City of Faith was $25 million in debt and Roberts closed the hospital. Most of the complex was converted to office space and leased out as CityPlex Towers. Much of the interior space was left uncompleted since the initial construction. 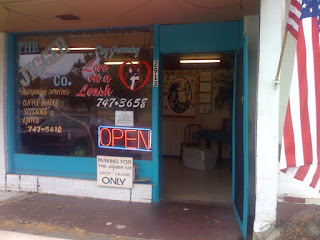 In 2007 the facility was about 50% occupied. The university whose campus is adjacent continues as a successful Christian Liberal Arts School. 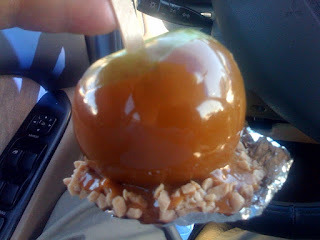 When I parked my car to go to my AA meeting at noon today, a very sweet lady came up and handed me a beautiful candied apple, and gave me a hug. She said she had made a batch and wanted me to have one. She said she really glad I was an alcoholic because I was one of the people who had helped her stay sober. How nice! It's a beautiful day, I have a new grandbaby, Susan is coming home tomorrow, and I just got a candy apple and a hug. What could be nicer? Autumn is begining to see Grant as "my brother" rather than "that one". She tries to help with the bottle and wants to hold him. Things are coming along. She has started calling him "Babygrant", all one word. It may stick as a nickname. "Good morning Babygrant,"
Susan will fly home tomorrow. Smokey and I will be glad to have her. 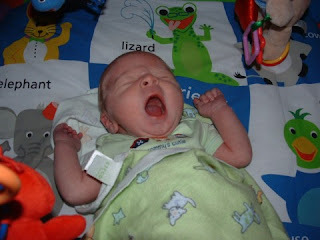 Newborn babys are a little like newborn kittens,their eyes are closed most of the time. Beth tried to prop him up with a pillow and get a picture of him with his eyes open. She had limited success. He is a bit rubbery but pretty good for only four days old. Today I have Go Deung Uh Gu-e, Roast Mackerel. This is my first time to try this and it was very good. It is served on a bed of cold sliced sweet onion which is a very nice compliment to the slightly salty fish. 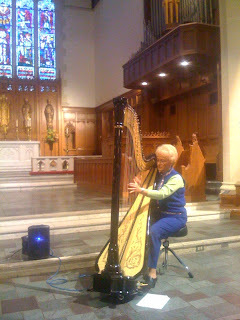 Today's peogram is harpist Linda Paul. 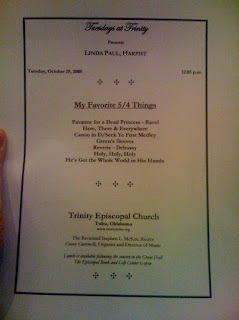 She is a member of Christ Church Episcopal, our home church. Linda plays with great beauty and warmth. Her harp was made in France. Trinity Episcopal Church is a beautiful old gothic structure. This is the new rear entrance. He cries, he eats, he poops, he yawns, he sleeps. Life is simple at 4 days old. Sue says he is a very happy healthy baby. Beth plans to keep him. At last, a picture of Grandmother Susan with her new grandson. 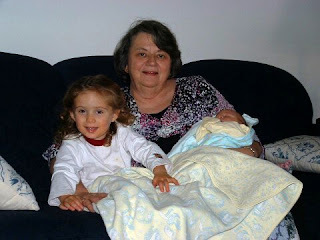 Two very beautiful grandcildren, don't you think so? She may never come home. The baby is fine and Autumn is very interested. She was given a nice baby doll with bottle and diapers. Now she and mommy both have new babies. She will make a nice sister. 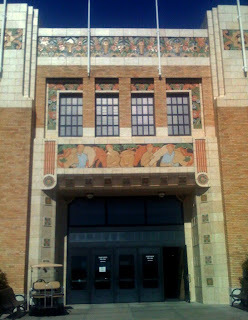 Designed by architect L. I. Shumway, the arena was built as a WPA project during the great depression. It seats about 6500 in a variety of configurations and hosts ice hockey, rodeos, basketball games and rock concerts. 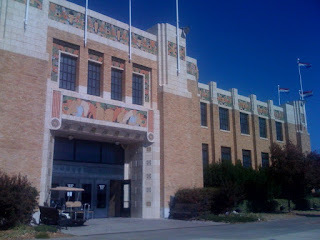 Built in 1932, the Fairgrounds Pavilion is an Art Deco treasure. An extremely flexible arena, it can go from ice floor to basketball court to concert seating in a matter of hours. We are all very happy. Beth and Grant are already home and in excellent condition. Susan is worshiping her new grandson. All is well. At last some photos of our new grandson. 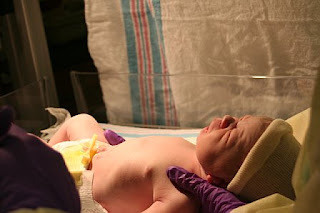 He was born October 23rd at 8:17 Eastern and weighed 8 pounds 9 ounces and is 20 and 1/2 inches long . He has blond hair and grey eyes. He is very beautiful. Never was a baby more fondly received. This very popular radio variety show with Garrison Keiller has been a weekly favorite on National Public Radio for over 30 years. Based in Saint Paul, Minnesota, it travels around broadcasting from a number of cities and has been in Tulsa several times, always to a packed house. Dusty and Lefty, Guy Noir, Fred Newman's sound effects, local talent Elvin Bishop and Monica Taylor - the whole enchilada. You missed a good show, Susan. I hope you listened on the radio. 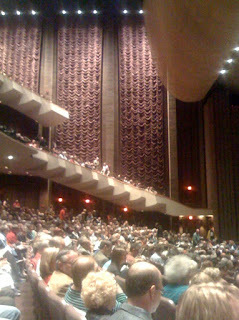 The Tulsa Performing Arts Center is full to the brim tonight. 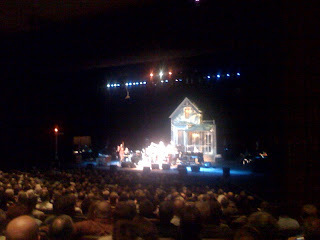 My friends Ed and Lois and I have tickets for garrison Keiller's "Prairie Home Companion" radio show which is bradcasting from Tulsa tonight. Sue is away so our friend Eli is using the ticket. My iPhone is amazingly convenient but has some limitations as a camera. I have a better Fuji with greater resolution and a telephoto. This picture was taken from the same spot but the better lens and telephoto allows the skyline of downtown Tulsa to be visible in the distance . It also reveals the second bridge, I-44 (51st Street) just beyond the 71st Street bridge in the foreground. 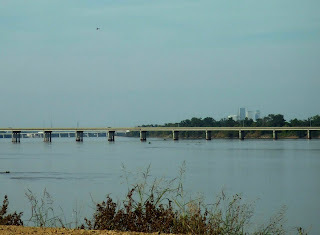 The Eastern end of the I-44 bridge is very near my home. CLICK on the photo to see it larger and you will notice that the little black speck near the top on the left side is a helicopter. Mother and baby are already home and doing fine but I am still waiting for photographs. Arghhh! Looking North from about 86th Street on the West side. The first bridge in sight is the 71st Street bridge. It is hard to find a place to drive close enough to the river to get a picture. This is actually a sand and gravel dump for city trucks. 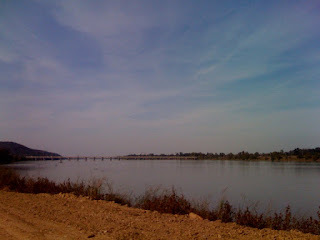 I am sharing river pictures because Sue has not managed to email her photos of the new grandbaby. She says he has pink cheeks, blond hair, and grey eyes; and of course he is beautiful. I will share photos as soon as I get them. Grant Jay Lashmet, 8 pounds 9 ounces (3.88 kilos), born 1 hour 23 minutes ago. Mother and baby are doing fine! Photos to follow soon. Stay tuned. 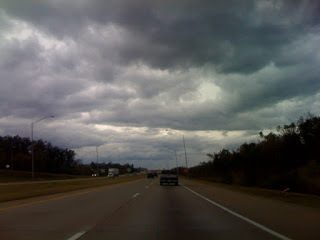 Driving back home the clouds are heavy and the wind is blowing. Cool air carries a gentle sweetness. Grass lies dark under gray skies heavy with rain. 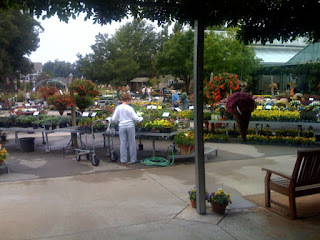 to fill the ponds and refresh the gardens. what in Oklahoma is called Indian Summer. Day after day of bright warm days and cool crisp nights. As soon as Susan returned the baby decided to come. 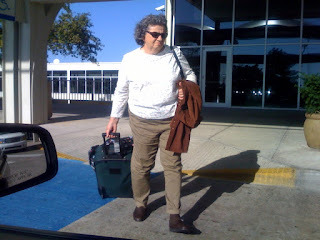 Sue was visiting her mother when her daughter-in-law Beth called. 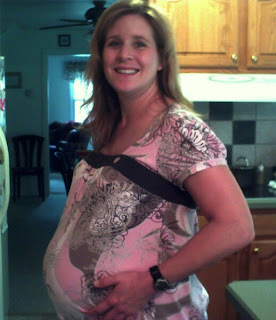 Beth told me between gasps that she was having contractions 5 minutes apart. Now Sue is flying back to look after little Autumn. Ah well, she was home for a nice birthday dinner and one restful night. Smokey will have to look after me for another week. Today is Mike's birthday so we invited him and his wife Amber over for dinner. Little Gavin stayed with his grandmother so we were able to have some nice conversation. Mike and my youngest son played soccer together and have been friends since they were 7 years old in the 2nd grade. 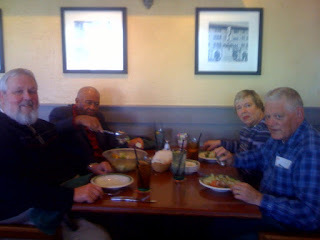 Mike spent a lot of time at our house when he was growing up and was a regular at our mealtime table. Now that Mike has his own family he lives nearby and is faithful to mow our grass and help with many things around the house. He is like another son to me. Tonight I grilled some very nice rib eye steaks, baked some sweet potatoes and had a nice green salad. Very delicious, and a little Boston Creme Cake for desert. 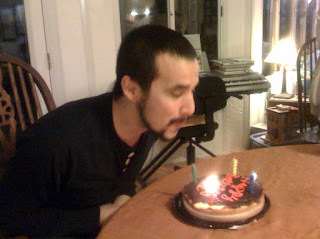 We lit the candles and sang Happy Birthday to Mike. It was a very nice evening. Sue's flight landed in pouring rain and crashing thunder. Daughter-in-law Beth's doctor has reset the baby's due date to October 27. Sue will go back when the baby gets serious. We stopped at the Blue Dome Diner for a late breakfast. Smokey and I are pleased to have her home. Summer is past and nights are turning cooler. We are beginning to see some fall color but we need a touch of frost to get the full show. It is nice when the outer leaves turn color while the inside leaves are still green. This is Indian Summer and I love this time of year. The days are warm and dry, the nights are cool and crisp. It is time for long walks and football games. 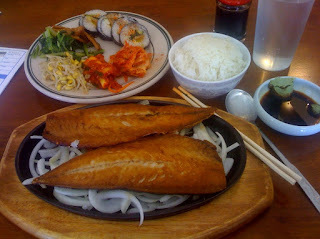 I was tired of making sandwiches for lunch so I decided to treat myself to my favorite Korean restaurant. 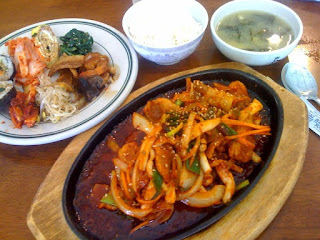 This is Ohsam Bulgogi, marianated calimari and pork served sizzling hot. Delicious! 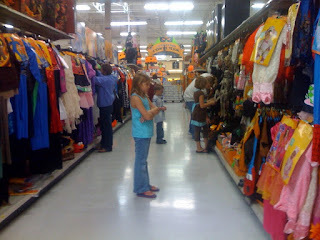 The Halloween aisle at the Walmart Supercenter is full of kids looking for just the right costume. You can tell that Halloween is drawing near because the garden area has been replaced with Christmas decorations. I borrowed this photo from the PSO website. Click on it to see it better. 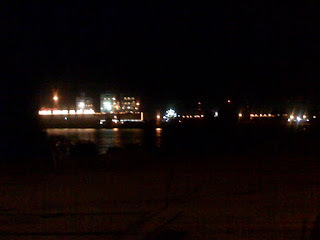 The red letters read "Electricity", the white letters "PUBLIC SERVICE CO. OF OKLA."
Here is the same view at night. 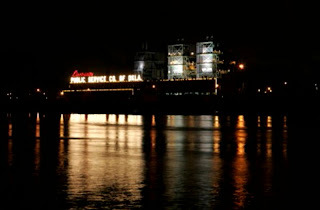 The plant has been in PSO's generation fleet since 1922. The illuminated sign has been a Tulsa landmark since the early 1950s. It has more than 3,200 red and clear light bulbs. I have to admit that my iPhone camera is not quite adequate for this lighting situation. 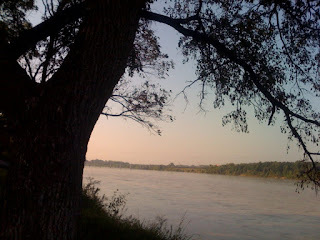 Since I live a block from the Arkansas River I drive up or down Riverside Drive every day. Tulsa was built on the curve of the river as it swings from East to South. Riverside Drive runs down the East side of the river from the center of town South for about 10 miles. The area between the road and the river is the River Park. There is a running path which runs the length of it. At various locations are rest areas, playgrounds, several Frisbee golf courses, a rugby field, and places to fish. The city is in the process of making a lot of improvements to the park which explains the dirt work. Actually the subject of this photo is on the opposite side of the riverat about 31st Street. 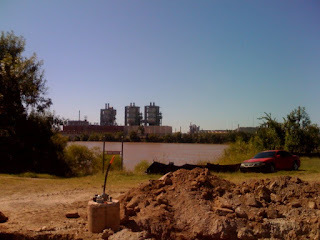 This is one of the gas fired electrical generating plants that supply Tulsa with power. Looking South from near 66th street. Three year old Autumn is about to be pushed out of the nest by the new chick. Although she is accustomed to getting all of the attention, she will surely enjoy being a big sister. Susan emailed a couple of pictures to me from our daughter-in-law Beth out in Maryland. Her usual model's figure has expanded somewhat now that she is 9 months and 15 minutes from having the new grandchild. Everyone is ready for the big event except the baby who is dawdling. Beth has a visit with the doctor today and they may decide to hurry things along. In the meantime, Smokey and I are bachelors. 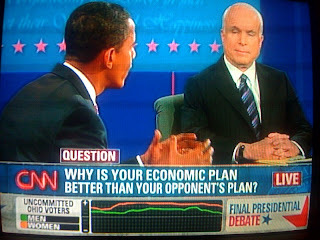 Sen. Barack Obama and Republican presidential nominee Sen. John McCain participate in the third and final presidential debate at Hofstra University in Hempstead, New York. This video clip is not from my iPhone but I wanted to share it with you. The back of our house is a long garden room with wall to wall windows. Probably you have seen it in some of my pictures. I have a number of bird feeders hanging outside the windows and pretty sun catchers on the inside. It is a pleasant room that looks over the flowers in out back garden. As a result, we have a lot of birds to watch. Beginning last February a handsome male Cardinal moved in and decided that our back garden was his private sanctuary. He doesn't bother the other birds but he allows no other male cardinal into his territory. He and his sweetheart have nested in one of our maple trees and raised a nice family. None of this is particularly noteworthy except that he regards his own reflection in our many windows as a rival and attacks the glass. He does this every day from dawn to dusk. We assumed that he would get over it eventually but here it is in mid October and he is still at it. If he had any brains he would have bashed them out by now. We really don't notice the constant pecking noise anymore. He doesn't seem to mind our coming and going but I do hesitate to go out in the back garden wearing red. Nevertheless, Smokey looks and smells very nice, and always gets a new neckerchief. It doesn't show up well in the photo but this one has a Halloween pumpkin design. He is very proud. 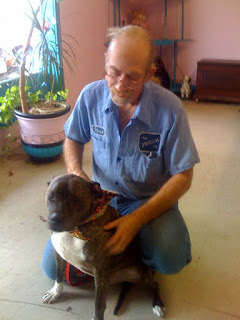 About once a month I take Smokey to "Love on a Leash" for a bath and toe nail trim. He likes the groomers but is not crazy about the water. You might say he has mixed emotions. He is good tempered about it. 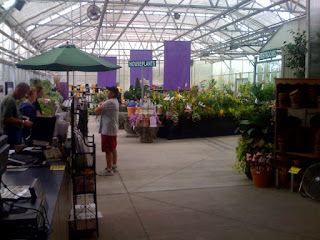 They are at 2913 S Harvard Ave.
One of the nice things about Southwood is that the people who work there know a lot about the plants they sell, how to plant them and care for them. Their expertise is part of the product they sell. 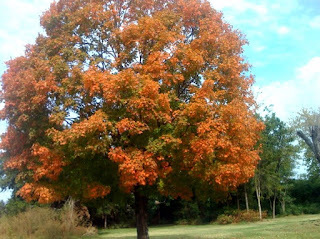 When I moved into my little house in Tulsa's Brookside area it was completely bare of any trees or shrubs. Over the past 15 years it has been transformed into a nicely landcaped garden. We found a lot of things at Southwood. They seem to have everything. These hardy chrysanthemums bloom somewhat in the spring then grow rank over the summer to put on a very nice display in the fall. They all come from a single potted mum I bought at plant nursery years ago and tossed aside when the frost nipped it. To my surprise they emerged again in the spring so I dug a hole and gave them a spot. Over the years I have spread them out and let them take over the bed. 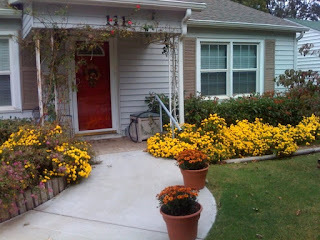 They coexist nicely with the day lilies, dwarf crepe myrtle, and climbing roses on the porch posts. The idea is that something is blooming all the time with practically no effort on my part. 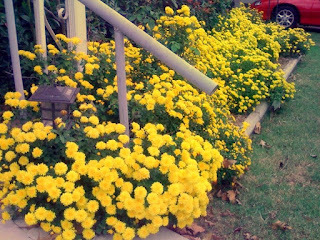 The chrysanthemums in the front flowerbed of our little house are beginning to put on their annual show. 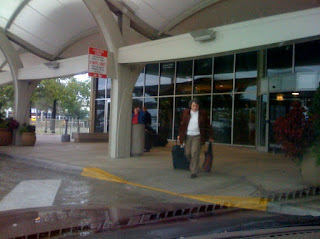 Susan left very early this morning to fly to Eastern Maryland to visit her daughter-in-law Beth. 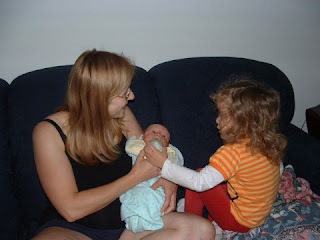 Sue will look after Beth's 3 year old daughter Autumn while Beth gives birth to our new grandson. Beth can deal with the newborn, it is the fractious Autumn who requires the services of her grandmother. Sue's son Paul is a Navy officer and has recently been shipped to a new assignment in South Korea, leaving Beth temporarily without her helper. At the present time sue and I have 8 grandchildren between us, 7 girls and 1 boy. This new one is expected to be a boy which makes him even more special, if possible. Susan is very excited. I will miss her company, but it is for a good cause.